The façade of the house is a part of our intermediate house façade permutations study that gets constructed. 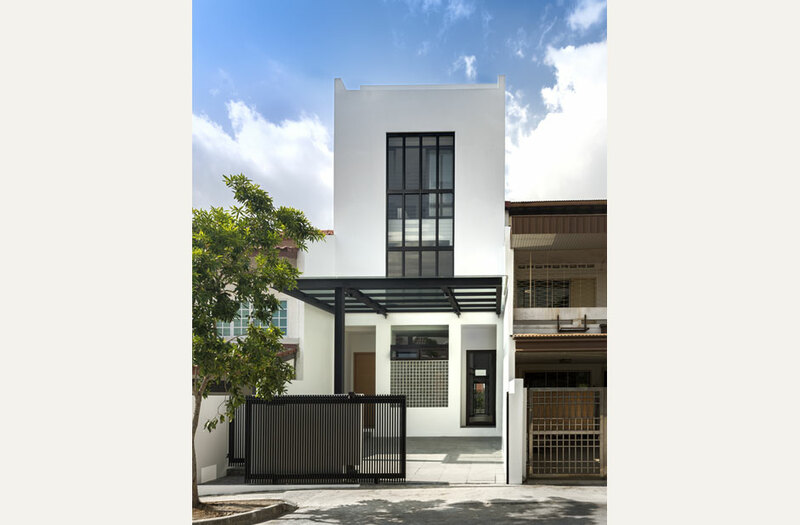 It is a geometric composition consisting of symmetrical recessed openings where the main timber door is placed, glass blocks, fixed glass, top hung windows and operable glass louvers panels on the upper floors. Inside the house, there is a triple volume space that connects the rooms on the 3.5 storeys house. As the Owner daughters enjoy dancing, he has devoted half of the 2nd floor to be a natural ventilated dancing studio with the Masterbed Room behind. All the rooms are, regardless of where it is located, enjoys natural light that filters in and ventilations.